If you have ever had someone tell slanderous lies about you, then you know how difficult it is to regain the trust and confidence of the ones who heard those lies about you and believed them to be true. So it is with our Elohim (God) Who created the Universe. There have been many lies perpetrated by the enemy of Elohim and man, Satan, and it is sad to see how successful he has been in carrying out what he began in heaven over 6,000 years ago and has continued to do on the earth. In Revelation 12:9, we are told, “And the great dragon was cast out [of heaven], that old serpent, called the Devil, and Satan, which deceiveth the whole world: he was cast out into the earth" (emphasis added). He was not cast out of heaven into a place called “hell," but he was cast of heaven “into the earth” where he has been perfecting his work of deception. Satan is using many lies in his deception of the whole world, but in this article we will be focusing on just one of them. Maybe the most insidious one of all of them. “Hell." Most of the world, including sad to say many of the Christian Community, believe hell is a place where the wicked or lost are tortured in a fire that burns forever but are never consumed and this is imposed upon them by Elohim. A loving Elohim (1 John 4:8) and a just Elohim (Isaiah 45:21)? The Elohim that said “an eye for an eye and a tooth for a tooth” (Leviticus 24:20). The teaching of hell, as most have come to know it, sounds more like what a sadistic being (Satan) would do than a Being described as “love” and “just." Satan has taken a truth found in the Bible and has twisted it into a diabolical lie in order to turn mankind away from Elohim and to even lead mankind to hate such a Being that would do such a thing to His creatures. "Who changed the truth of Elohim into a lie" (Romans 1:25). We wonder sometimes why it is that more people do not come to Elohim? Many have had such a dreadful picture painted in their minds of what Elohim is like, that we cannot blame them for not turning to our Elohim, when you consider how Satan has portrayed Him to be. The “hell” that a majority have pictured in their minds is of Satan’s invention for the purpose of slandering Elohim and causing the people of this earth to turn from Him and to even hate Him. The saddest part of it all is that Satan has men and women, who profess faith in the Elohim of the Bible, believing in this slanderous accusation of Elohim and then repeating and promoting Satan’s slander. Nothing could be more blasphemous than how Elohim has been portrayed to mankind by Satan and by men who are professed ministers of Elohim! 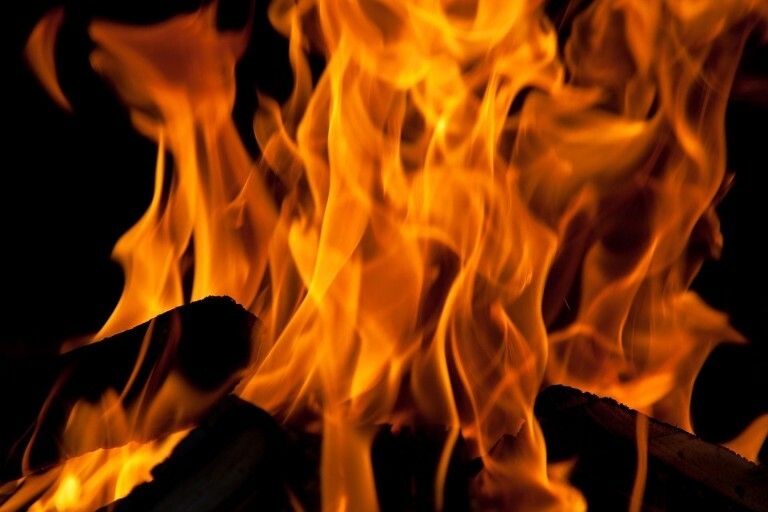 Who does the Bible say lives in “devouring fire” and “everlasting burnings?" “The sinners in Zion are afraid; fearfulness hath surprised the hypocrites. Who among us shall dwell with the devouring fire? Who among us shall dwell in everlasting burnings? He that walketh righteously, and speaketh uprightly; he that despiseth the gain of oppressions, that shaketh his hands from holding of bribes, that stoppeth his ears from hearing of blood [does not listen to gossip and lies], and shutteth his eyes from seeing evil; he shall dwell on high: his place of defence shall be the munitions of rocks: bread shall be given him; his waters shall be sure” (Isaiah 33:14-17, em[phasis added). Most, I dare say, do not even know that a verse such as this exists in the Bible which clearly tells us who lives in eternal burning fire. As we shall see in the following Bible texts, the wicked are “burned up” or “perish” by that “devouring fire," but the righteous are able to live in its presence. Why? Because the “devouring fire” consumes the sin which sinners cling to along with the sinner, while the righteous have been “cleansed from all unrighteousness [sin]” (1 John 1:9) and will not be harmed by Elohim’s presence. Elohim is described as a consuming fire. "For our Elohim is a consuming fire" (Hebrews 12:29; Deuteronomy 4:24). Some may ask is it possible to live in a "devouring fire?" Shadrach, Meshach and Abednego can answer that best for us. They were faced with bowing down to the image of gold that Nebuchadnezzar had set up or being thrown into a burning fiery furnace. “Then was Nebuchadnezzar full of fury . . . and commanded that they should heat the furnace one seven times more than it was wont to be heated . . . Therefore because the king’s commandment was urgent, and the furnace exceeding hot, the flame of the fire slew those men that took up Shadrach, Meshach and Abednego. And these three men, Shadrach, Meshach, and Abednego, fell down bound into the midst of the burning fiery furnace. Then Nebuchadnezzar was astonied, and rose up in haste, and spake, and said unto his counsellers, Did not we cast three men bound into the midst of the fire? They answered and said unto the king, True, O king. He answered and said, Lo, I see four men loose, walking in the midst of the fire, and they have no hurt; and the form of the fourth is like the Son of Elohim. Then Nebuchadnezzar came near to the mouth of the burning fiery furnace, and spake, and said, Shadrach, Meshach, and Abednego, you servants of the most high Elohim, come forth, and come hither. Then Shadrach, Meshach, and Abednego came forth of the midst of the fire . . . upon whose bodies the fire had no power, nor was an hair of their head singed, neither were their coats changed, nor the smell of fire had passed on them” (Daniel 3:19-27, emphasis added). Even amidst a furnace that was heated “seven times more than it was wont to be heated” fire could not harm those who were loyal to Elohim. You might even say that it was a “devouring fire” or a "consuming fire." The Bible is very clear that “the truth shall make you free” (John 8:32). What does the truth set you free from? From the “lies” that Satan is using to deceive the whole world with. And the biggest one of them all is on the subject of “hell." The word for “hell” in the Old Testament is "sheol" which could also be translated as “grave.” When the Bible was translated, the prejudices of those who did the translating were included in how they interpreted sheol. The word translated as “hell” in the New Testament is "hades" which also could have been translated as “grave.” Again the prejudices or preconceived opinions of the translators are apparent in how they translated from the old manuscripts to what we find written in the Bible today. If you go to the Strong’s Concordance and in the Old Testament look up the words “grave” and “hell” you will see the same Hebrew word translated into the two different words (#7585). If you go to the New Testament and look up the words “grave” and “hell,” you will see there are instances where both “grave” and “hell” are translated from the Greek word “hades” (#86). The prejudices of the translators are apparent in their use of “hell” over the use of “grave.” This is not to disparage the translators for they had been taught a false concept for so long that it just naturally came through their translations. In the New Testament, another Greek word translated as “hell” is gehenna (Strong’s Concordance #1067) or the Valley of Hinnom, which was a place like the “city dump” that some of you might still remember as always burning or smoldering until new trash was thrown on it and which never went out. Gehenna is used in Matthew 10:28. “And fear not them which kill the body, but are not able to kill the soul: but rather fear Him (Elohim) which is able to destroy both the soul and body in hell [Gehenna – the ‘lake of fire’]” (emphasis added). The following section will show you what happens to the wicked or lost according to the Bible. According to the Bible, the wicked or lost will be “cut off," “perish," “consumed," “devoured," “destroyed,” and will be “no more." They “shall be as though they have never been." The wicked will not be tormented or tortured throughout ceaseless ages of eternity! In order for the wicked to be tormented throughout eternity they would have had to have immortality bestowed upon them, but according to 1 Corinthians 15:53, 54 only the righteous receive immortality at the return of Yahushua. See our study on the State of the Dead and Associated Topics (Click on shaded area to go to the link.) for a discussion on what happens to man after he dies. “FOR, BEHOLD, the day cometh, that shall burn as an oven; and all the proud, yea, and all that do wickedly, shall be stubble: and the day that cometh shall burn them up, saith Yahuwah of hosts, that it shall leave them neither root [Satan] nor branch [Satan's follwers]. And you shall tread down the wicked; for they shall be ashes under the soles of your feet in the day that I shall do this, saith Yahuwah of hosts.” Satan is the “root” and his followers are the “branches." Note: To quench simply means to extinguish. None will be able to put this fire out until everything is consumed or burned up. The wicked will be turned to ashes just as when wood is burned up. “For. Behold, the day cometh, that shall burn as an oven; and all the proud, yea, and all that do wickedly, shall be stubble: and the day cometh shall burn them up, saith Yahuwah of hosts, that it shall leave them neither root or branch. . . And you shall tread down the wicked; for they shall be ashes under the soles of your feet in the day that I shall do this, saith the LORD of hosts” (Malachi 4:1, 3). Note: When the destruction of the wicked has been completed Elohim’s “indignation shall cease, and Mine anger [shall cease] in their destruction." Note: When the wicked are cast into the “lake of fire” and turned into ashes, they will experience the “second death” from which there is no resurrection and their memory will eventually be forgotten. “And death and hell were cast into the lake of fire. This is the second death. And whosoever was not found written in the book of life was cast into the lake of fire” (Revelation 20:14, 15). Note: Some have made a covenant with the devil which will carry no weight with Elohim. Their covenant with the devil will be declared null and void. “Because you have said, We have made a covenant with death, and with hell are we in agreement; when the overflowing scourge shall pass through, it shall not come unto us: for we have made lies our refuge, and under falsehood we hid ourselves: . . . And your covenant with death shall be disannulled, and your agreement with hell shall not stand; when the overflowing scourge shall pass through, then you shall be trodden by it” (Isaiah 28:15, 18). Note: “The soul that sinneth it shall die” the second death and not just the first death. See Revelation 20:14, 15. Note: “Affliction shall not rise up a second time.” What a comforting thought, that sin with all its accompanying results will be forever eradicated and never enter into the Universe of Elohim again! Note: Zechariah 14 is talking about when the New Jerusalem comes down from heaven and Yahushua stands on Mt. of Olives and prepares a place for the city to land (Zechariah 14:4) as it comes down from heaven to be on this earth forever. The wicked will attack the city after they have been resurrected and fire comes down from Elohim out heaven and consumes the wicked as described in Zechariah 14:12. See Revelation 20:9 and 21:2. Note: When anything is burnt up, only ashes remain. When someone is cremated the only thing left of them is their ashes. Note: Probably the most familiar verse in the entire Bible and probably the least understood. Eternal life or perish. The only two options available to mankind. Note: The wages of sin is not everlasting torture. The wages of sin is the second death which the wicked or lost shall suffer when they are cast into the lake of fire and are burned up and only their ashes remain. See Revelation 20:14, 15. Note: They are enemies of the cross of Messiah who would perpetuate the most slanderous lie invented by Satan that Elohim would torture and torment His enemies throughout eternity. Note: The wicked will be punished with “everlasting destruction” and not with everlasting punishing or torture or torment. The punishment they will receive will be everlasting in its results. Note: The unjust do not receive their reward upon dying. They sleep in the graves until they are resurrected after the 1,000 year period to meet their judgment on the “day of judgment”. The lost or wicked will be punished, but it will be a fair and just punishment for their rebellion against Elohim. See Revelation 20:5. Note: Perdition by definition means “eternal death” which is what the second death is all about. The second death will be eternal. There will be no resurrection from it. But Elohim wants as many as are willing, to be saved and have eternal life . He is not seeing how many He can keep out of heaven, but how many can be gathered into heaven to spend eternity with Him and with His Son, Yahushua. He has paid an enormous price for our redemption (ransom)! Note: The wicked are not punished until they are judged. As in earthly tribunals so in the heavenly court. There are two phases of judgment that take place in the trials of earth. The first phase determines the guilt or innocence of the defendant. The second phase determines the length and type of punishment. The righteous will even determine the length of punishment which the fallen angels and Satan must endure (1 Corinthians 6:3). Be sure that the wicked will suffer for their crimes, but it will be a fair and just ruling and not an unjust ruling of eternal torture for their crimes. They will be eventually “destroyed” once they have suffered the length of time that has been determined. Note: The fire that “devours” the wicked cleanses the earth and Elohim recreates the earth back to its original Edenic beauty, where He will dwell throughout eternity with those whom He has redeemed from among men. Note: Sodom and Gomorrha suffered the “vengeance of eternal fire”, but they are not suffering eternally. They are not still burning, are they? The results of the fire that destroyed those cities and their inhabitants are eternal. "For our Elohim is a consuming fire." From the abundant evidence we find written in the word of Elohim, we see that we serve a merciful and just Elohim Who does not delight in the suffering of His creatures, including those who will be lost for eternity but will do the compassionate thing and will put them out of their misery. “There is no peace for the wicked” (Isaiah 57:21). This will be done after bringing upon them their just punishment. He would have cured them of the dreadful disease of sin, but they would not come to Him that He might purge them of their inherited, fallen, human nature. “Him that cometh to Me I will in no wise cast out” (John 6:37). Yahushua told Peter and He tells us: “If I wash thee not, thou hast no part with Me” (John 13:8). Only Yahushua can wash us from our sins and make us pure and holy (without sin). In the lives of all who are lost, there will come a time when they will recall the pleadings of Elohim that they have rejected, and they themselves will admit that “just and true are Thy ways” (Revelation 15:3). I pray that the picture of Elohim you have in your mind has become clearer as to what type of a Being He really is. He has declared of Himself, I am “Yahuwah, Yahuwah Elohim, merciful and gracious, longsuffering, and abundant in goodness and truth, keeping mercy for thousands, forgiving iniquity and transgression and sin, and that will by no means clear the guilty” (Exodus 34:6, 7). The guilty will be punished, but in a just manner. “Thus saith Yahuwah, Let not the wise man glory in his wisdom, neither let the mighty man glory in His might, let not the rich man glory in his riches: but let him that glorieth glory in this, that he understandeth and knoweth Me, that I am Yahuwah which exercises lovingkindness, judgment, and righteousness in the earth: for in these things I delight, saith Yahuwah” (Jeremiah 9:23-24, emphasis added). “And this is life eternal, that they might know Thee the only true Elohim, and Yahushua Messiah Whom Thou hast sent” (John 17:3). Many preachers and denominations have used the slanderous lies of Satan to scare people out of hell and into heaven, and in doing so have greatly distorted the character of our loving, Heavenly Father Who said “Yea, I have loved thee with an everlasting love: therefore with lovingkindness have I drawn thee” (Jeremiah 31:3). There is no use of fear or intimidation by our Elohim in drawing us to Himself. Those are the methods of our enemy, Satan, who is the greatest terrorist and sadist on this earth. “And the times of this ignorance Elohim winked at; but now commands all men everywhere to repent: because He hath appointed a day, in the which He will judge the world in righteousness” (Acts 17:30, 31) and not in unrighteousness. Elohim is not going to allow what is taking place in this world to continue forever. He will put an end to what is going on in the near future, and He is seeking to save all those who will come unto Him. He is offering you a deal too good to be refused. “For Elohim so loved the world, that He gave His only begotten Son, that whosoever should believe in Him should not perish, but have everlasting life” (John 3:16, emphasis added). “Today, if you hear His voice harden not your heart” (Hebrews 3:15, emphasis added) and accept the terms of salvation given to us in the Scriptures. In concluding this article on the subject of “hell,” I am including two parables of Yahushua found in the thirteenth chapter of the book of Matthew and the interpretation of one of those parables is also included. “Another parable put He forth unto them, saying, The kingdom of heaven is likened unto a man [Yahushua] which soweth good seed in His field: but while men slept, his enemy [Satan] came and sowed tares among the wheat, and went his way. But when the blade was sprung up, and brought forth fruit, then appeared the tares also. So the servants of the householder [Messiah's disciples] came and said unto Him, Sir, didst not Thou sow good seed in Thy field? From whence then hath it tares? He said unto them, An enemy hath done this. The servants said unto Him, Wilt Thou then that we go and gather them up? But He said, Nay; lest while you gather up the tares, you root up also the wheat with them. Let them both grow together until the harvest: and in the time of the harvest I will say to the reapers, Gather you together first the tare, and bind them in bundles to burn them [how the wicked will be destroyed]: but gather the wheat into My barn” (Matthew 13:24-30, emphasis added). What do the pre-rapture theorists do with these verses which show the wicked are gathered first? “Then Yahushua sent the multitude away, and went into the house: and His disciples came unto Him, saying, Declare unto us the parable of the tares of the field. He answered and said unto them, He that soweth the good seed is the Son of man [Yahushua]: The field is the world; the good seed are the children of the kingdom; but the tares are the children of the wicked one; the enemy that sowed them is the devil; the harvest is the end of the world; and the reapers are the angels. As therefore the tares are gathered and burned in the fire; so shall it be in the end of this world. The Son of man shall send forth His angels, and they shall gather out of His kingdom all things that offend, and them which do iniquity; and shall cast them into a furnace of fire: there shall be wailing and gnashing of teeth” (Matthew 13:36-42, emphasis added). Nowhere in Scripture do we find a fire that burns forever. What it burns turns to ashes or goes up in smoke when the fire will go out for lack of material to burn (Psalm 37:20). There shall be wailing and gnashing of teeth by the wicked while they are burning but will come to an end once they are completely burned up. “Again, the kingdom of heaven is like unto a net, that was cast into the sea, and gathered of every kind: which when it was full, they drew to shore, and sat down, and gathered the good into vessels, but cast the bad away. So shall it be at the end of the world: the angels shall come forth, and sever the wicked from among the just, and shall cast them into the furnace of fire ['lake of fire' (Revelation 20:14, 15)]: there shall be wailing and gnashing of teeth. Yahushua saith unto them, Have you understood all these things? They say unto Him, Yea, Master” (Matthew 13:47-51). “All these things spake Yahushua unto the multitude in parables; and without a parable spake He not unto them: that it might be fulfilled which was spoken by the prophet, saying, I will open My mouth in parables; I will utter things which have been kept secret from the foundation of the world” (Matthew 13:34-35). The problem is we have been told this lie about "hell" for so long by so many people that when the truth on this subject is presented, people have a very difficult time of understanding it. When Ezekiel was told to go to the house of Israel, he was told to tell them what Yahuwah had told him, regardless of whether they would listen or whether they would forbear (not listen). See Ezekiel 3:1-11. Some will be upset by what is presented in this article because it contradicts what they have been taught and have held as truth. Whenever the Apostle Paul presented a subject to the people, he reminded the audience of the noble Bereans who studied out what they heard from Paul to see whether the things he was saying were according to the Word of Elohim. “These were more noble than those in Thessalonica, in that they received the word with all readiness of mind, and searched the scriptures daily, whether those things were so” (Acts 17:11). That is all we are asking of you. Study this subject out on your own and see if what is presented here is according to the Scriptures. If after having read this article, you believe it is Biblically accurate, we are asking you to forward it to your friends, relatives, and acquaintances. The truth must be given wide circulation in order that the deceptions of Satan may be made of non-effect. To scatter the darkness that Satan is enshrouding the earth, we must let the light of truth shine forth and not be hidden under a basket as is so often the case with those who come to know the truth! Satan is deceiving the whole world (Revelation 12:9), and it is your privilege, duty, and responsibility as the children of the most High to help make the truth of Elohim known in all the earth. We at Global Impact Studies are limited as to what we can do and pray that you will help the truth of Elohim (God) to be made known in all the earth. There are other areas that Satan is deceiving the multitudes of earth, and if you go to our Contents Page http://www.globalimpactstudies.com/contents.html you will find articles we believe will help you understand the truth according to the Scriptures. We are not to be ignorant of what Satan is up to (2 Corinthians 2:11). We must expose him. We thank you in behalf of our Heavenly Father! -- Global Impact Studies.